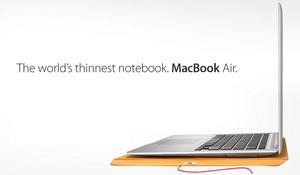 The MacBook Air, so thin you can put it into a manila envelope. But, why settle for any manila envelope when you can put it in ManilaMac’s, Airmail Manila folder notebook sleeve. The AirMail laptop sleeve is handmade out of durable upholstery-grade vinyl, and lined with fuzzy, soft fleece. All AirMail sleeves have the same dimensions as standard interoffice manila envelopes, which will serve to remind you — and everyone around you — that your new MacBook Air really is the thinnest laptop in the world! It’s $29.95 and I’m kind of tempted to get one just to put things in that I don’t want getting scratched.